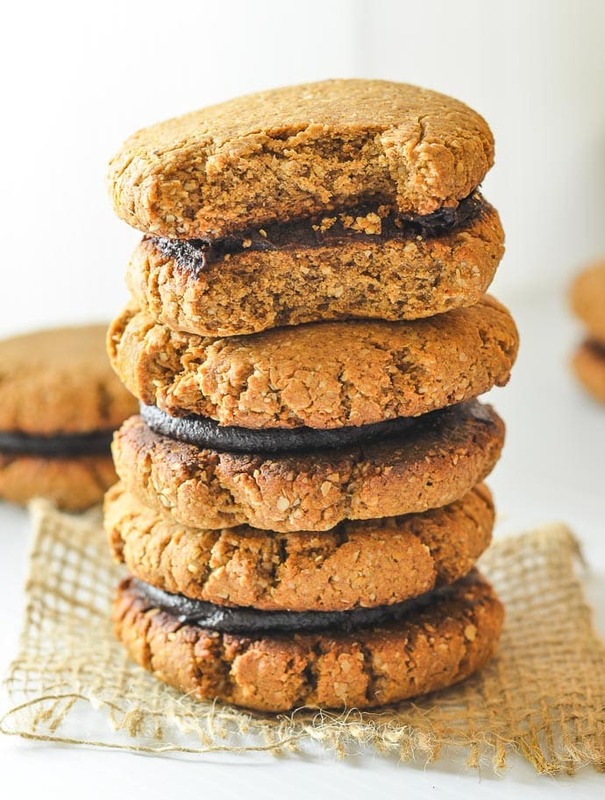 Perfectly tender & slightly chewy, these date-sweetened, super Healthy Pumpkin Ginger Date Cookies are perfect for snacking, refuelling or for when you want a healthier dessert. 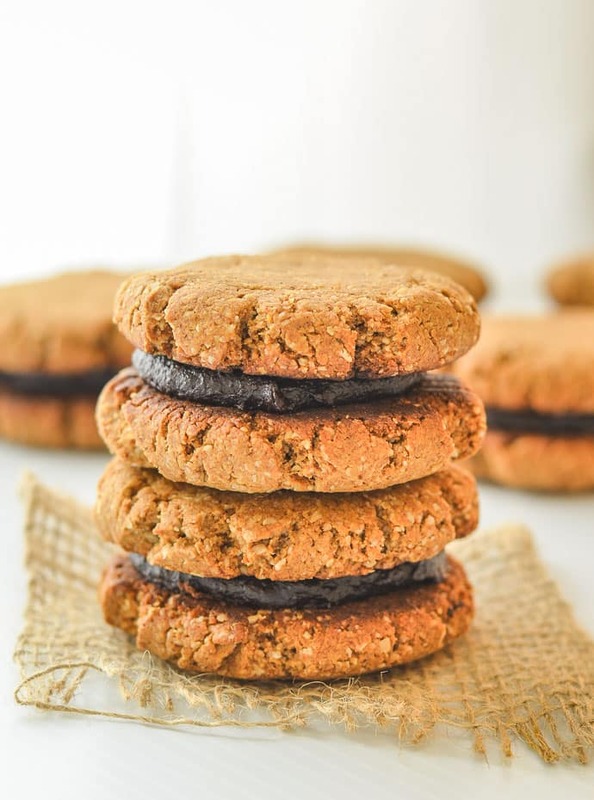 These cookies are a little different to most of the others here on AVV because they are super-duper healthy. Like probably the healthiest cookies ever. Kind of like my Super Seedy Power Cookies. They are vegan (obvi), gluten-free, oil-free and they have no added sugar at all. The sweetness comes only from dates. They are great for people who don’t have a huge sweet tooth and perfect for healthy snacks, refuelling or for when the munchies strike in the evening…Like every night if you are anything like me. We spent the weekend away in Vancouver and Whistler as my husband rode the Gran Fondo. These Healthy Pumpkin Ginger Date Cookies accompanied us for pre, during and post ride snackage. They are such great refuellers and because they are pretty big and stuffed full of healthy, whole foods ingredients, they are really filling too. Even the cookie-o-holic that is me can only manage one at a time. And after a very indulgent weekend away (in between the Gran Fondo-ing) full of amazing vegan foodie finds and perhaps one too many margaritas, healthy, whole foods are where it’s at this week. That said, you will be pleased to know that brunch was excellent, and he did forgive me after I plied him with a Mexican dinner and margaritas! ???? ¼ cup / 4 tablespoons almond butter , or other nut butter. To keep nut-free use Sun Butter. 1 tablespoons maple syrup , OPTIONAL. Only use if you want the filling to be a little sweeter. When made with banana you won't need it but pumpkin isn't as sweet so you might need some. Pit the dates and put them in a bowl, then cover them with hot water. Leave for around 10 minutes then drain. Add the oats to a food processor and process until a course flour like consistency. Add all of the other ingredients including the drained dates and process until a dough ball forms. Remove the blade, and take chunks of dough and roll into balls. Make the balls around the size of a walnut. Place the rolled balls on a baking tray, pressing the top of each one down into a cookie shape with the bottom of a glass or something similar. Make them about ¼ inch thick. Bake in the preheat oven for 15-20 minutes. They should just be starting to go golden around the edges but will still feel a little soft if you poke them. Add all ingredients to a food processor or blender and blend until completely smooth. 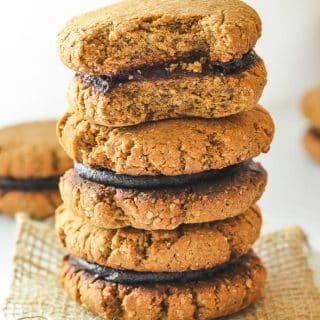 When the cookies are cool, add an even amount of filling to half of them then make sandwiches by placing the remaining cookies on top and squishing down gently so the filling spreads evenly. Store leftover cookies in an airtight container. They will keep for about 7 days.